Alfred James Wands was born in Cleveland, Ohio on February 19, 1904. Raised in Cleveland, he graduated from the Cleveland Art Institute with honors. He then spent time in Paris, France studying at the Academie Julian. He also studied in Brussels, Munich, and at Western Reserve University. After his travels in Europe he returned to teach at the Cleveland Art Institute and the Cleveland Museum of Art. During this period he had multiple works accepted into the Carnegie Institute's International Exhibits. Three years after this time period, he and his wife Dorothy, moved to Denver, Colorado where he became the Head of the Art Department of Colorado Women's College. He taught there for seventeen years. A few years after moving to Denver he became the daily hunting and fishing writer for the "Rocky Mountain News". He also published a very popular art instructional book entitled "How To Paint Mountains". In 1930 Wands discovered the painting community of Taos, New Mexico. He would spend the next eleven summers there. He became friends with, and painted with, many of the famous Taos artists of that period. By 1943 he had become the Camp Artist at the YMCA of the Rockies, where he taught summer art classes. He later became the Chairman of their Religious Programs and Adult Advisory Committees. By 1947 he had quit his teaching position at the Colorado Woman's College to devote full time to his painting. He was successful from the start. By 1955 he opened his own Studio and Gallery in Estes Park, Colorado. From the early 1950's he could be found spending his winters painting along the California Coast, and in Mexico. He spent many winters during the 1950's in Carmel, California painting images of the Monterey Peninsula. In 1965, when the Rocky Mountain National Park was reclaiming park lands, Wands purchased the pro shop at Steads Ranch golf course and turned it into his studio and gallery. In 1995, along with his son Robert, he opened a gallery in downtown Estes Park. Known as the "Dean of Colorado Landscape Painters", he served three times as the President of the Denver Artists Guild. He was the Chairman of the Denver Art Commission for 16 years. Wands was a long-time member of the Denver Artists Guild and the Denver Art Commission. He was also a member of the Cleveland Society of Artists, Ohio Watercolor Society, and Chicago Galleries Association. While spending winters in Carmel he was chosen as an Artist Member of the Carmel Art Association. Wands exhibited at the Cleveland Museum of Art, Cleveland School of Art, Denver Art Museum, Denver Artist's Guild, Western Arts Association, Carmel Art Association, International Watercolor Annual Exhibition, Carnegie Institute in Pittsburgh, Chicago Art Institute, Pennsylvania Academy of Fine Arts, the Corcoran Gallery in Washington, and the Sangre De Cristo Art Center, to name a few. In 1939 he participated in the New York World's Fair. He was an award winner in many of the venues in which his works were exhibited. 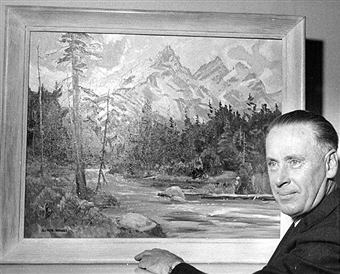 His works are in the permanent collections of the Cleveland Museum of Art, Palace of Legion of Honor in San Francisco, Kansas City Art Institute, Museum of Arts and Sciences in Brooklyn, New York, Colorado Springs Art Center, Western Reserve University, Denver University, Denver Public Schools, Sangre De Cristo Art Center, and University of Southern Colorado, to name a few. Alfred Wands died on October 27, 1998 in Sequim, Washington. Until his death, at the age of 94, he was active in the Olympic Camera Club and the Sequim Art Club. Alfred Wands Alfred James Wands was born in Cleveland, Ohio on February 19, 1904. Raised in Cleveland, he graduated from the Cleveland Art Institute with honors. He then spent time in Paris, France studying at the Academie Julian. He also studied in Brussels, Munich, and at Western Reserve University. After his travels in Europe he returned to teach at the Cleveland Art Institute and the Cleveland Museum of Art. During this period he had multiple works accepted into the Carnegie Institute's International Exhibits.